Would you like to own the roads? | What Car? Would you like to own the roads? 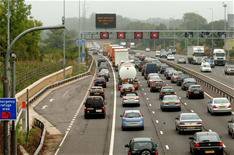 Motorways and major roads should be privatised, charges of 10p a mile introduced, and road tax scrapped, according to the Social Market Foundation think tank. The organisation also suggests that every citizen should get a 1500 equal share in the strategic road network, which it values at 95 billion. Owners could either sell the share immediately or retain it to benefit from the profits made by citizen-owned holding companies, which would operate motorways and trunk roads. The Social Market Foundation admits that this kind of voucher privatisation would need to be conducted carefully, so that it would not lead to the kind of oligarchy seen in Russia after public utilities were privatised. It believes that people in the UK would not be forced into immediately selling their shares to make ends meet as happened in Russia, while a regulatory body would oversee share transfers and road pricing. The think tank says the average motorist would pay 75 a year less through the proposed 10p charges than they currently spend on road tax. Is this a brilliant idea? Would you sell you share immediately, or buy as many as you could in the hope of becoming the next Roman Abramovich? Click [here](mailto:peter.lawton@haymarket.com?subject=Voucher privatisation) to let us know what you think.